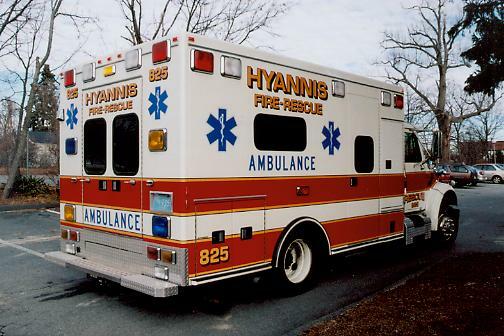 HYANNIS - WHAT'S YOUR NUMBER? 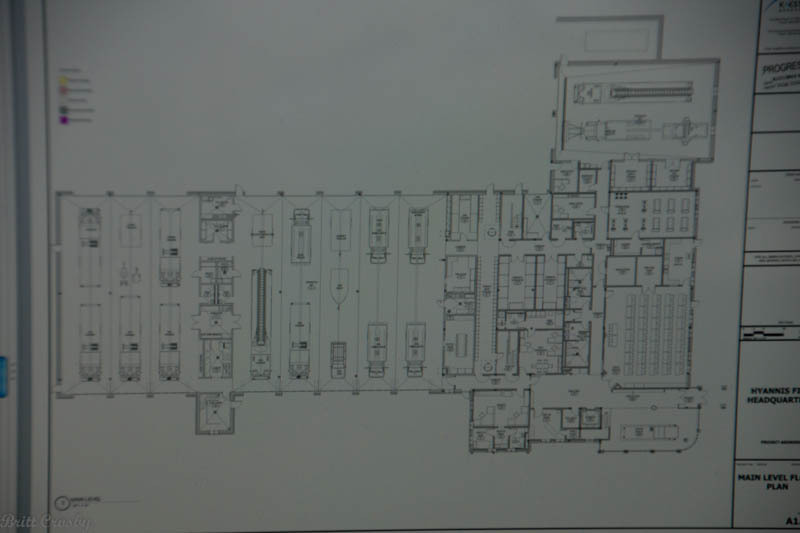 as of February 19, 2018. 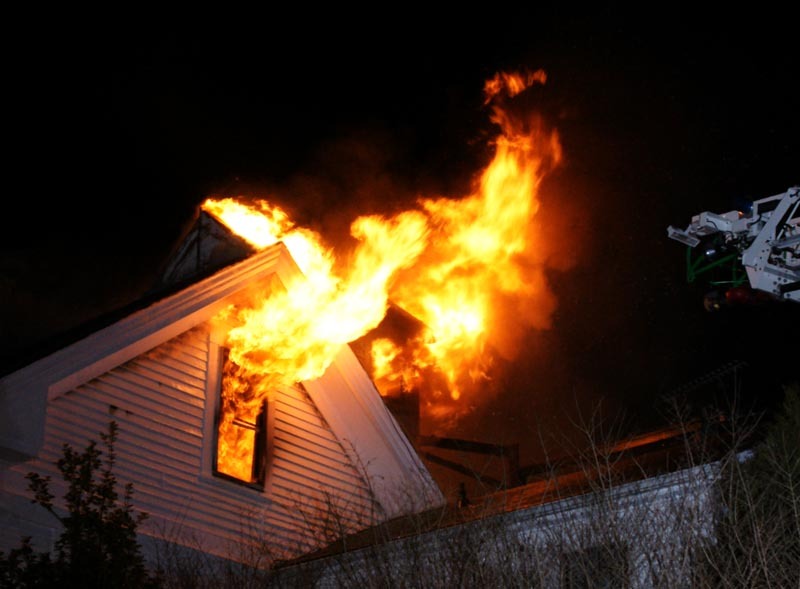 Essentially it is as follows. 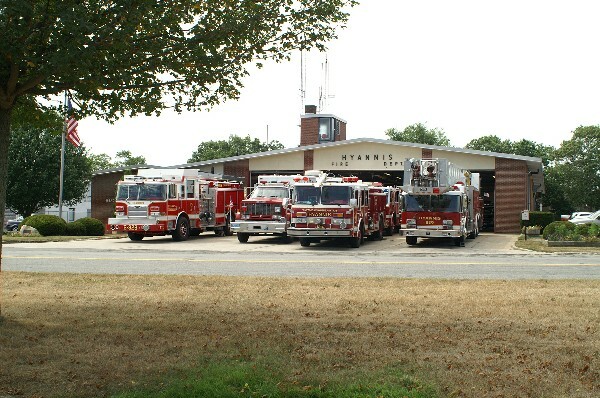 Barnstable Police dispatch center in the spring. 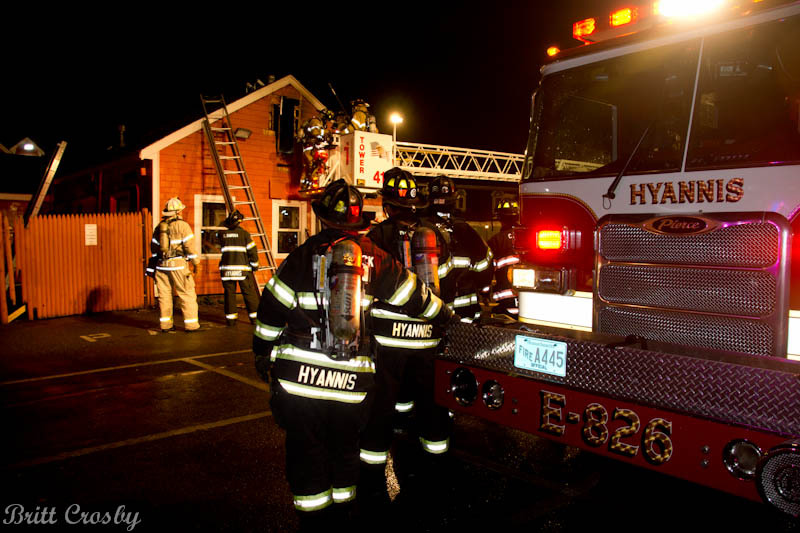 work with Hyannis and with Pierce. 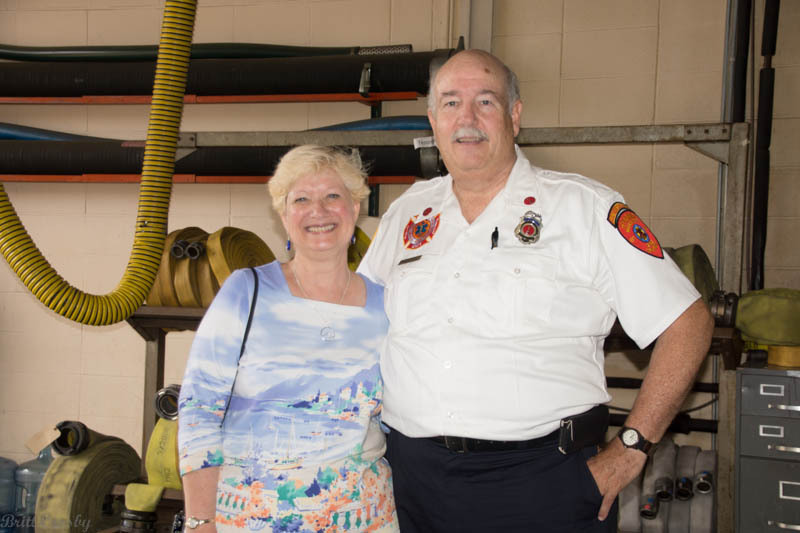 Congrats and best wishes! 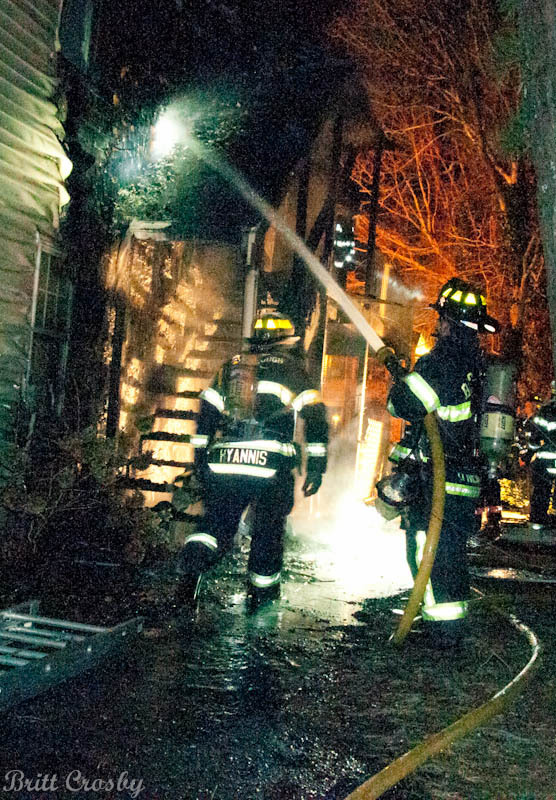 from Pierce rep John Jenkins. 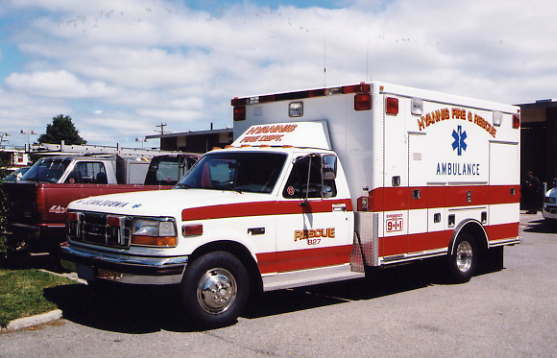 2009 Metal Craft "Firestorm 30"
Type I ambulance in service as Ambulance 827. 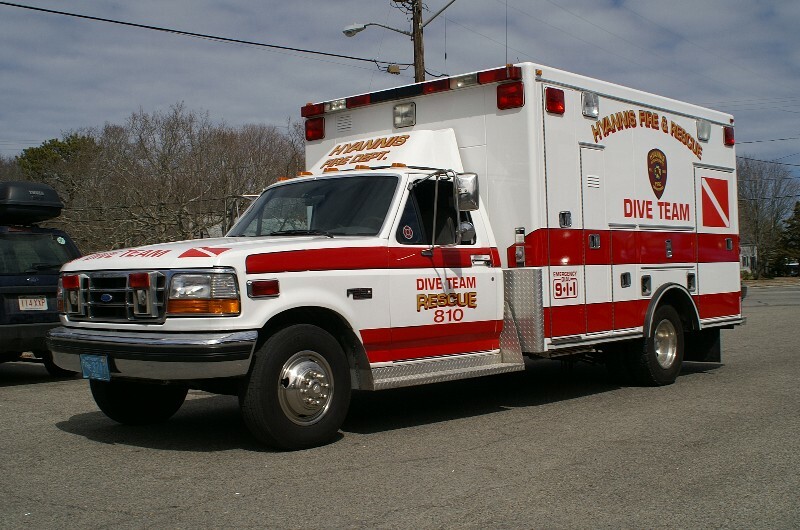 It replaces the 1992 Ford / Road Rescue that will now become the Dive Truck. 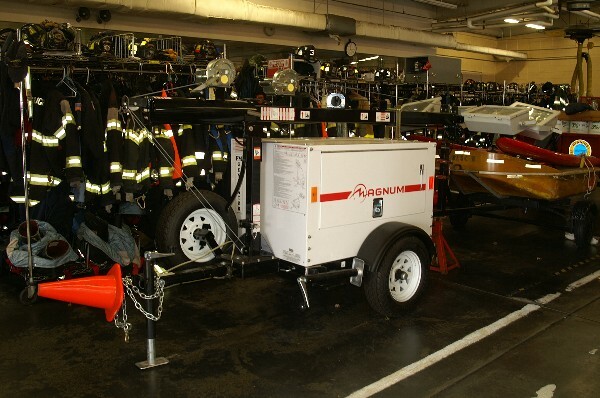 Hyannis has one of these new Magnum 600w Generator / Lighting towers. 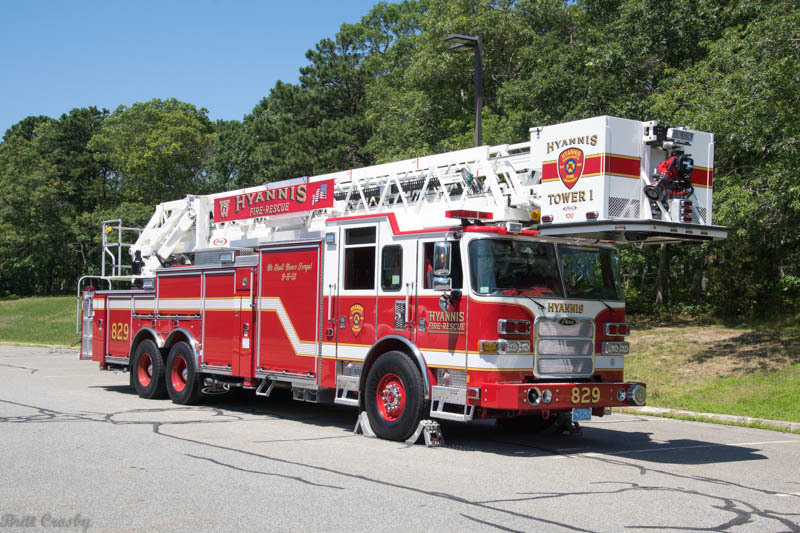 It is one of five received by local fire departments. 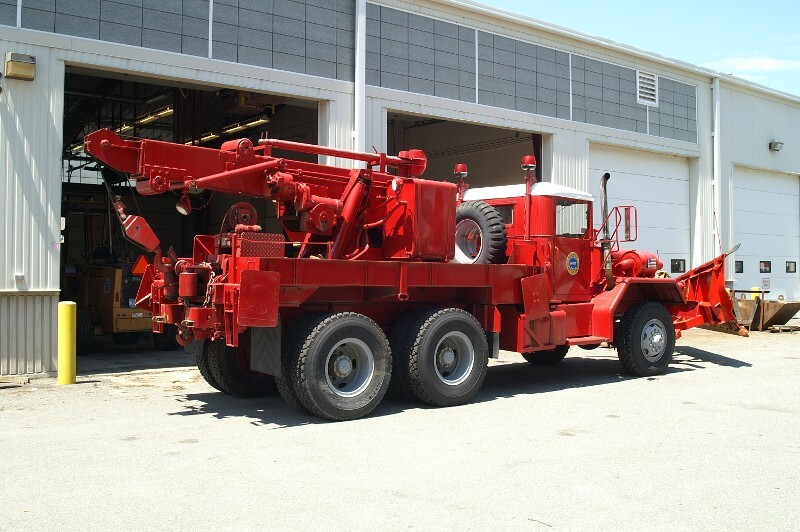 2005 Pierce Arrow XT 1500 gpm / 750 gal / 50 Class B foam Pumper. 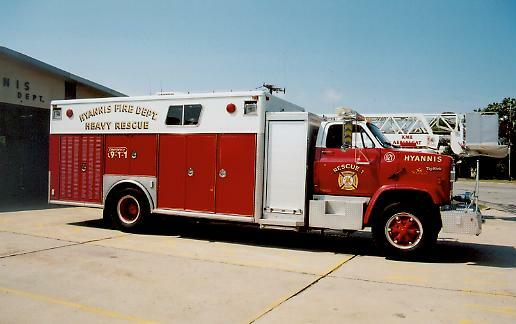 The engine has a tilt cab, pre-connected attack and trash lines on the rugged bumper, rollup doors on the rescue body, a ladder rack, and 6 man cab. 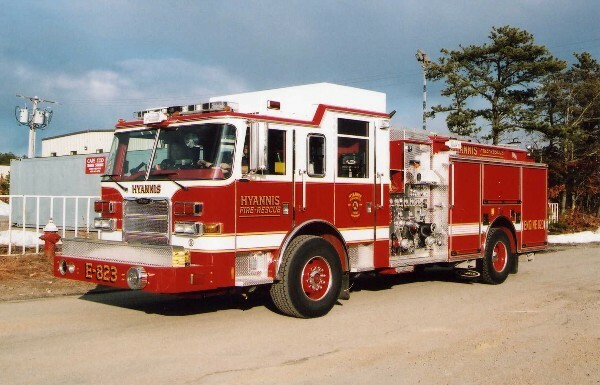 The new engine will go in service following a training period. 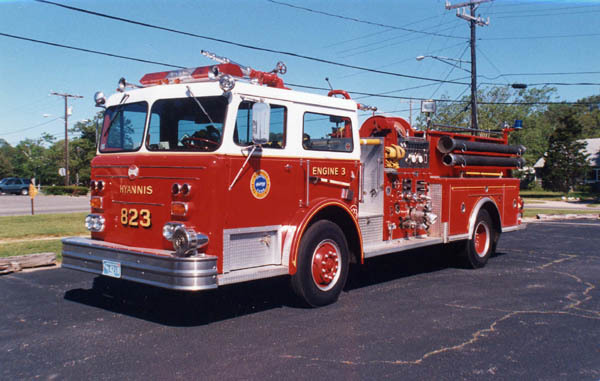 The new engine 823 will replace this 1975 Maxim 1500 gpm engine. 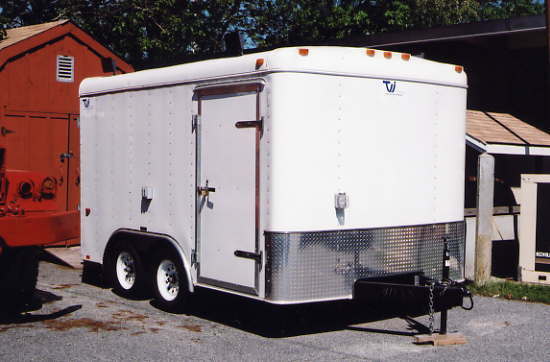 these trailers to departments with hospitals. 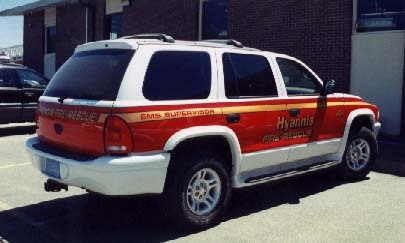 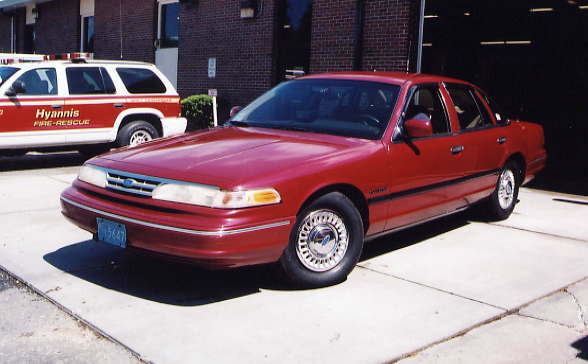 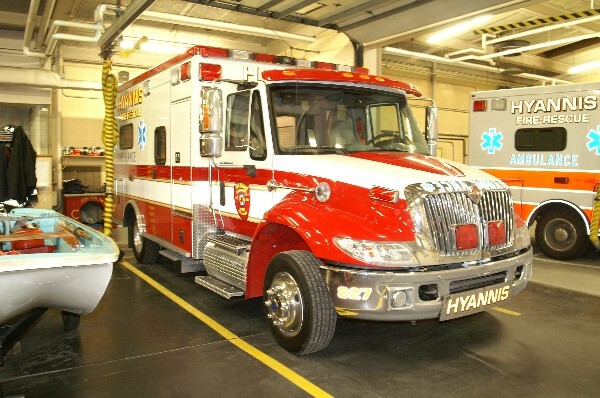 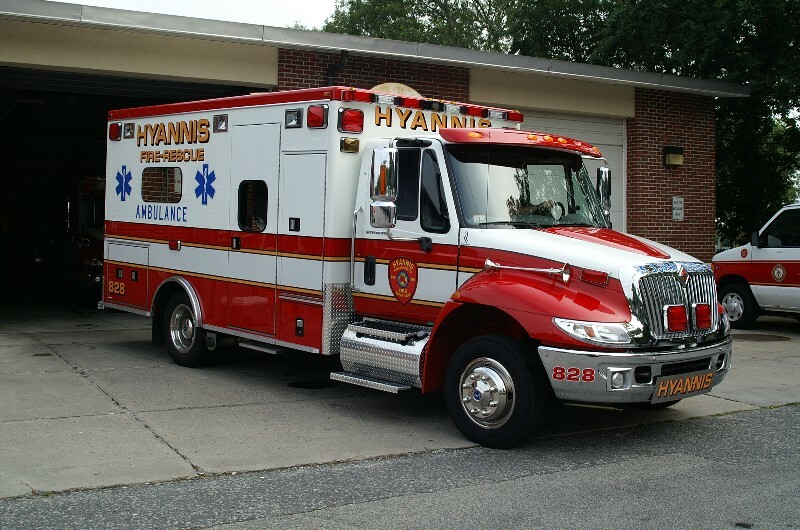 Hyannis voters approved a new ambulance at the May 2003 meeting. 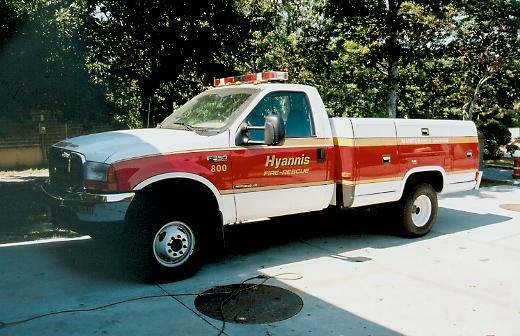 Hyannis's 1985 GMC / Ranger Heavy Rescue Truck originally had a 500 gpm pump and 300 gallon water tank located just behind the cab. 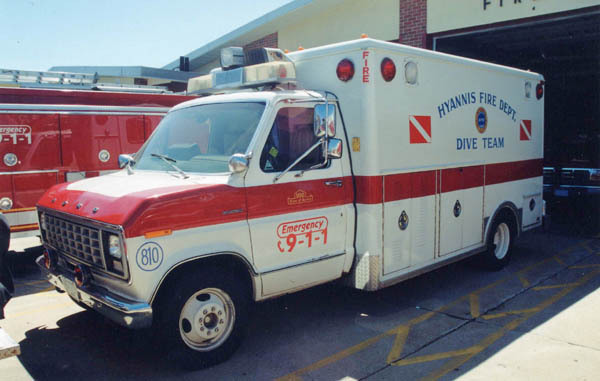 The pump and tank were removed and a new roll up door style compartment added in its place in Spring 2001. 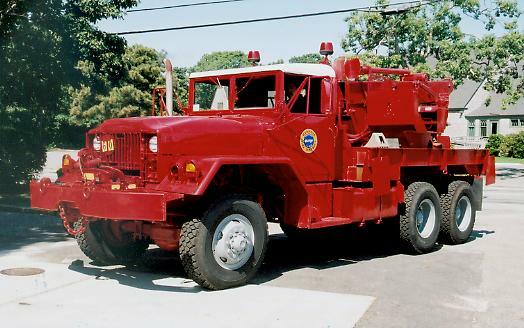 Hyannis picked up a surplus 1967 International 5 ton all wheel drive heavy duty military wrecker a couple years ago. 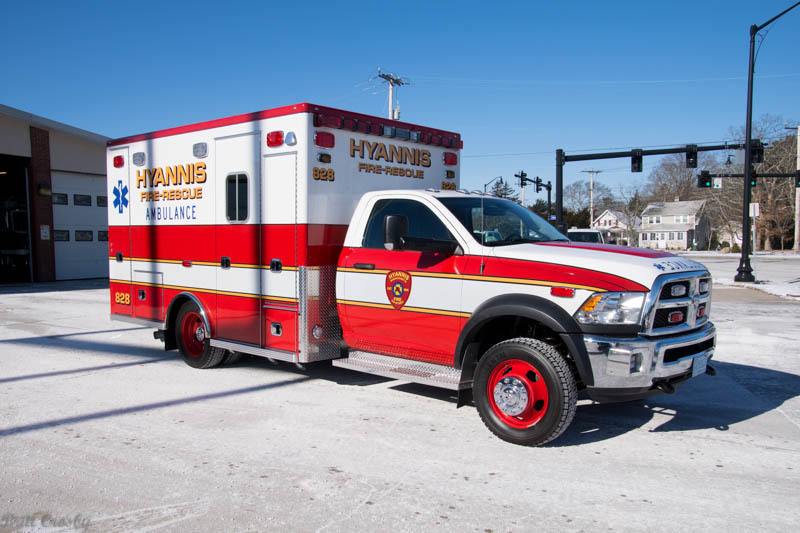 It has been painted red and white and is in service for heavy rescue work as well as serving other communities as needed. 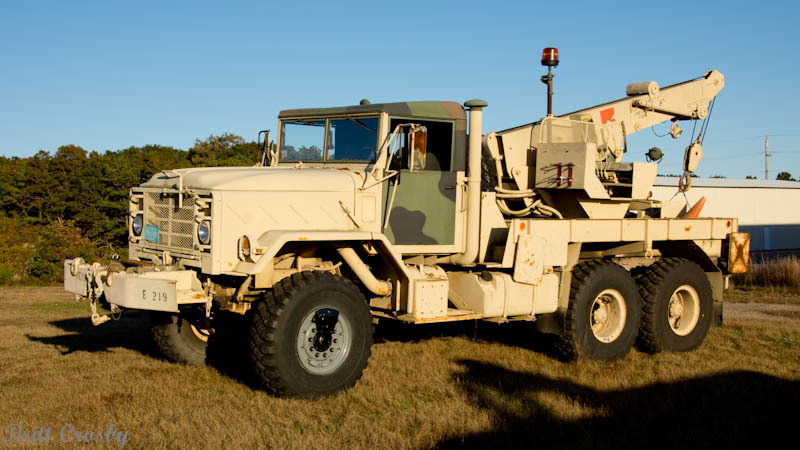 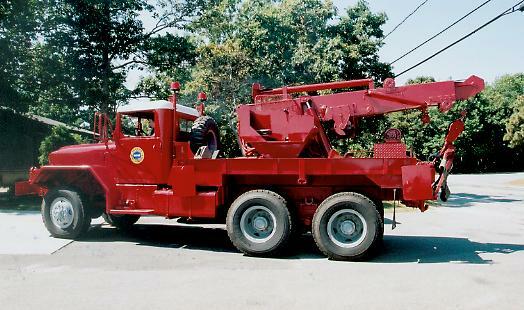 It has a 10 ton front winch, 23 ton rear winch, and 10 ton - 18 foot boom for lifting. 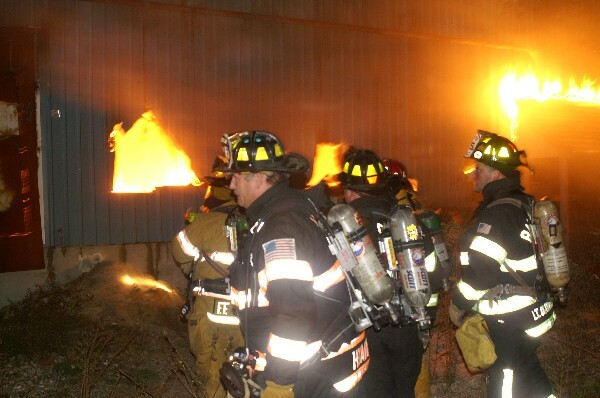 being adjusted in an attempt to reduce the potential costs. 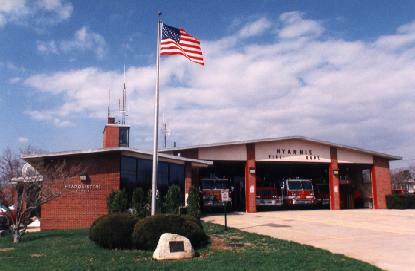 headquarters on High School Road Ext. 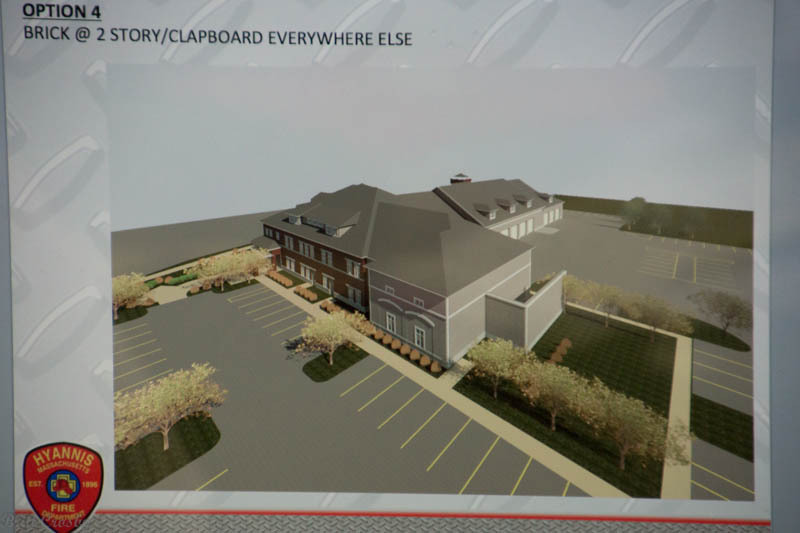 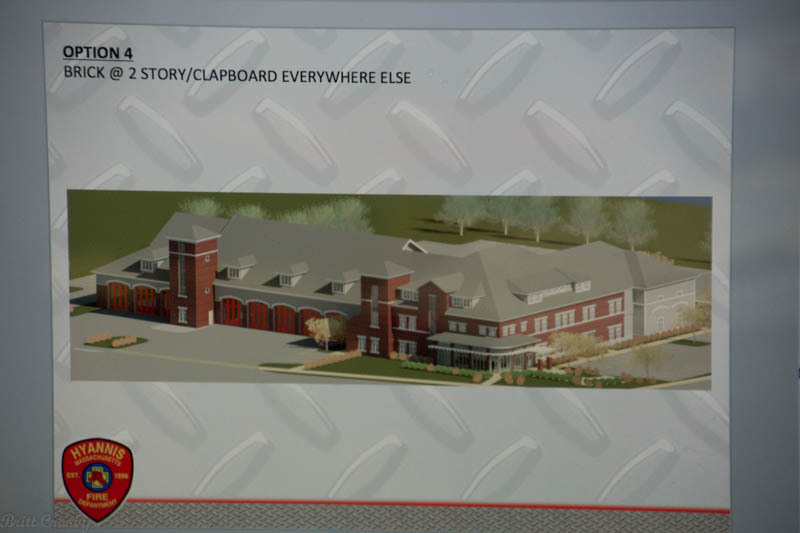 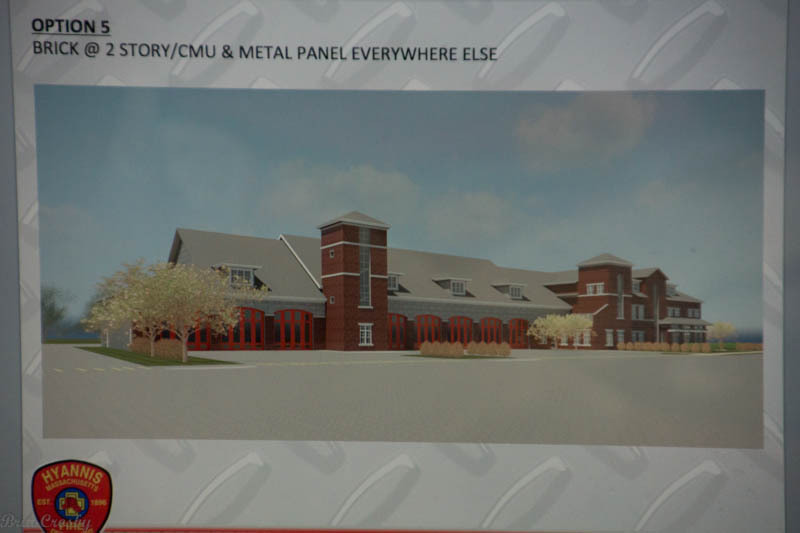 for the purposes of building a new fire station. 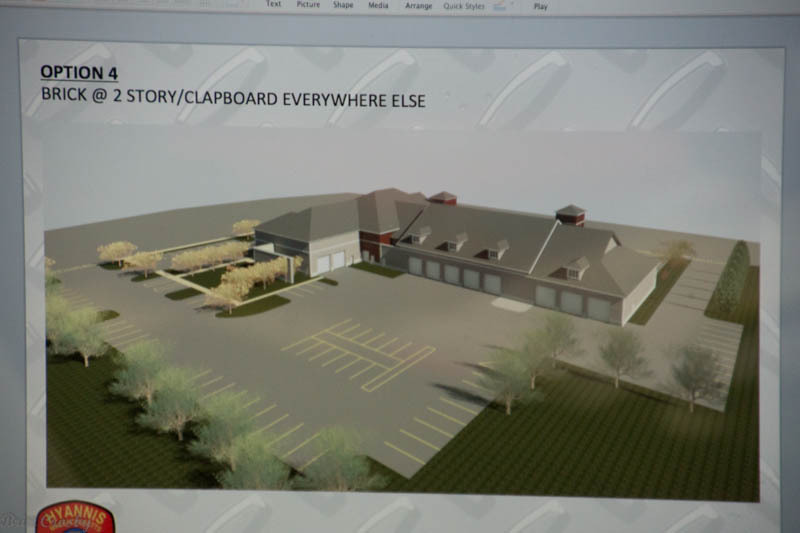 of the needs and potential for moving forward with a new station soon. 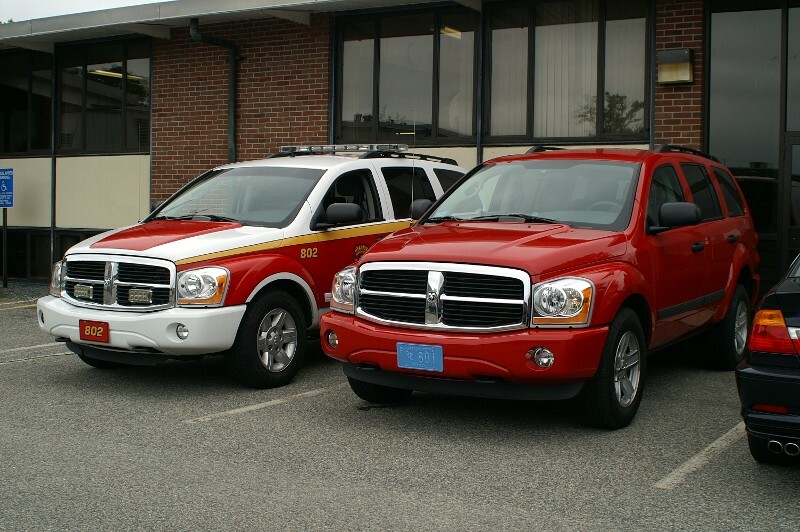 Some options are being evaluated relative to the department's station needs. 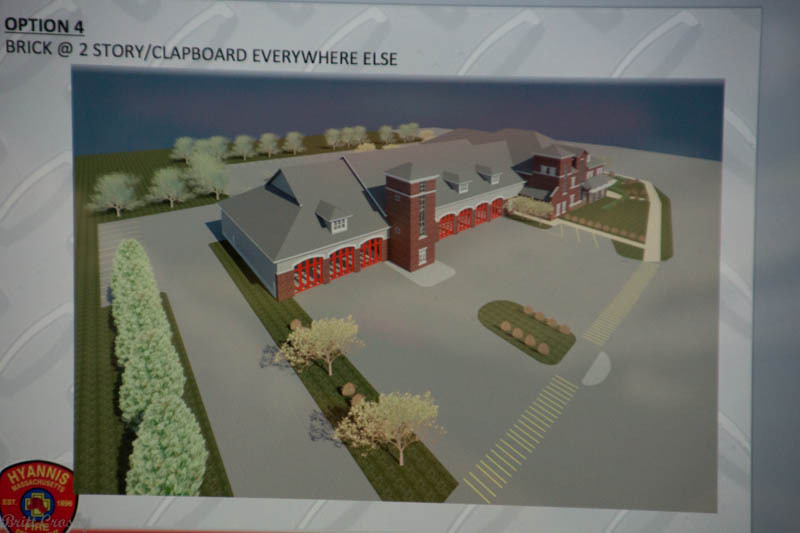 The station originally built in 1964 has already been added onto and renovated a couple times, but has no further room for expansion. 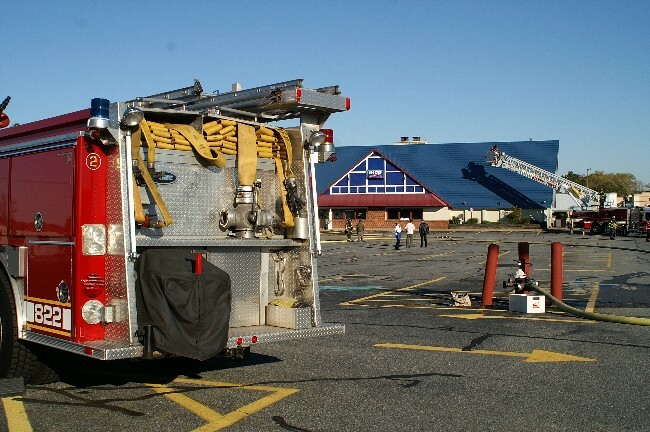 On site parking, training areas, office space, and living space are among the concerns in addition to the full apparatus floor. 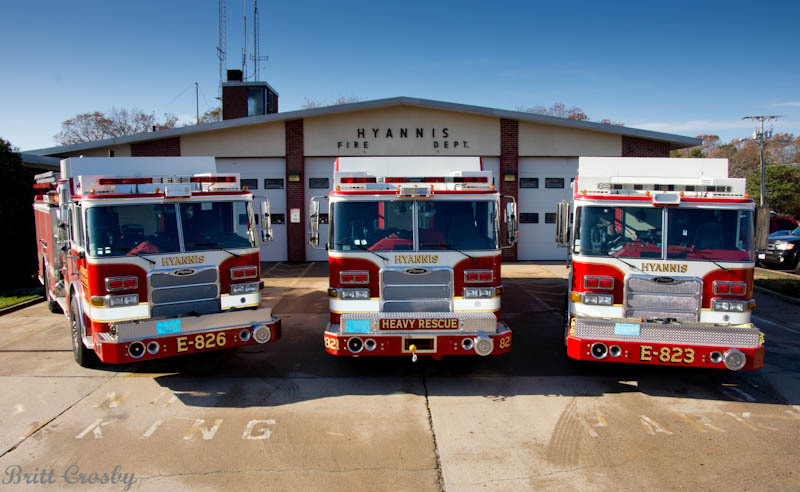 Hyannis recently made several permanent appointments and promotions and has rearranged personnel on shifts. 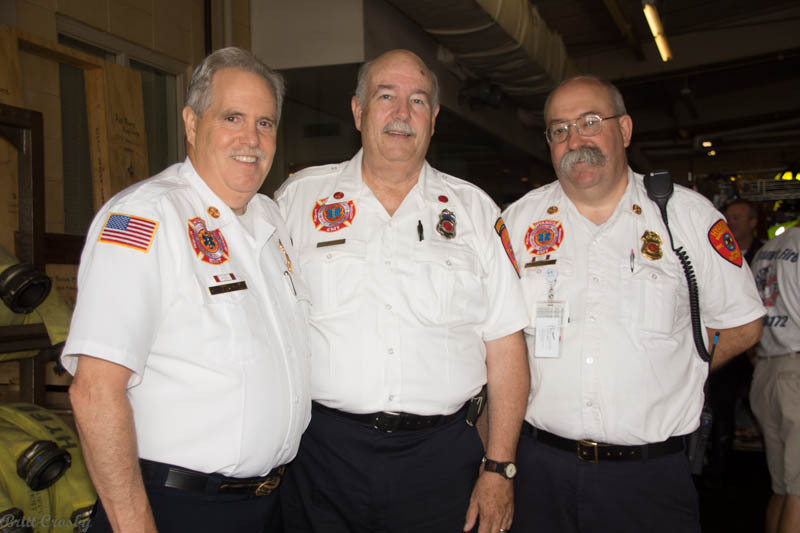 Congratulations to Captain Gregory Dardia, Lt Jeffery Lamothe, Lt Nate Coughlin and Lt "KC" Pike who were all made official in Nov 2015.
passed away on November 18, 2015.
and to New York City on 9-11-01 for the World Trade Center collapses . 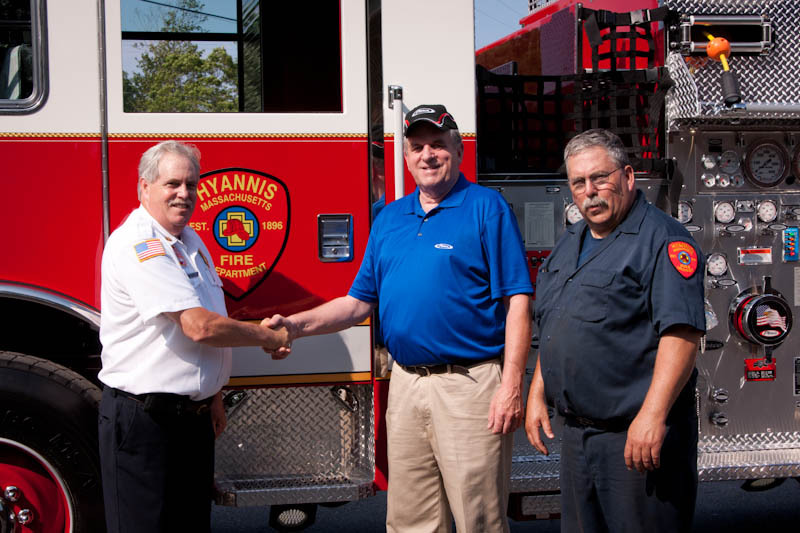 Funeral Director working with the Seymour Funeral Home in Potsdam, NY. 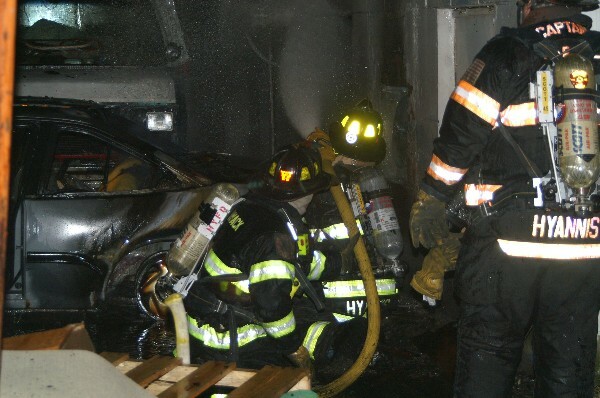 Assistant Chief and as a New York State Fire Instructor until his death. 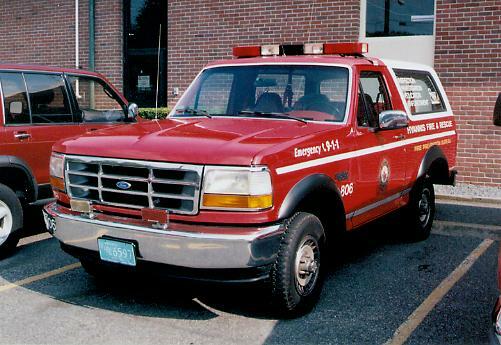 His passing came after a brief hospitalization at the Canton-Potsdam Hospital. 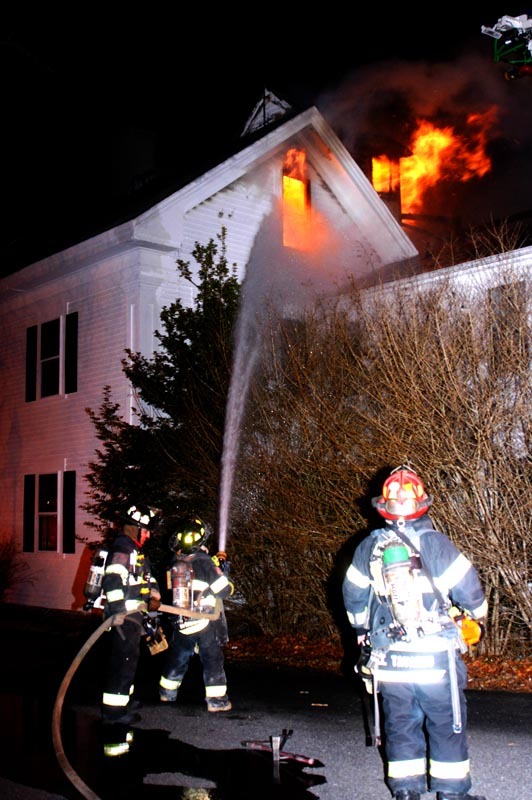 the Seymour Funeral Home, 4 Cedar St, Potsdam, NY. 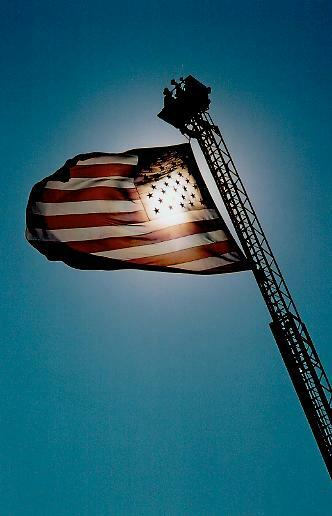 at the St. Mary's Cemetery in Canton. 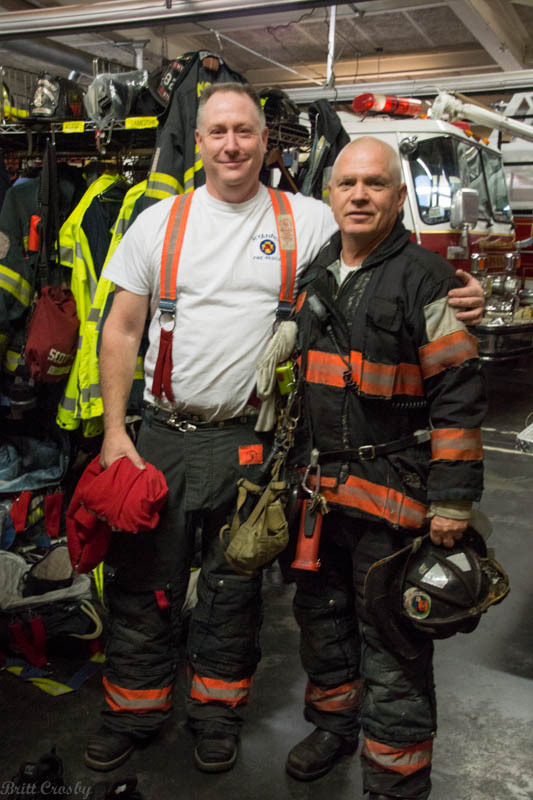 Brett was a good friend, a good firefighter, and a good paramedic. 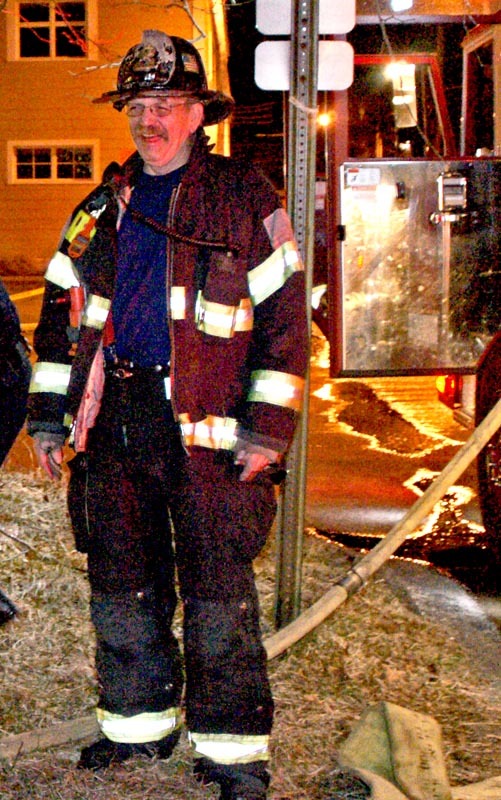 Captain Craig Farrenkopf of the Hyannis FD will be retiring with some 45 years of service in December 2014. 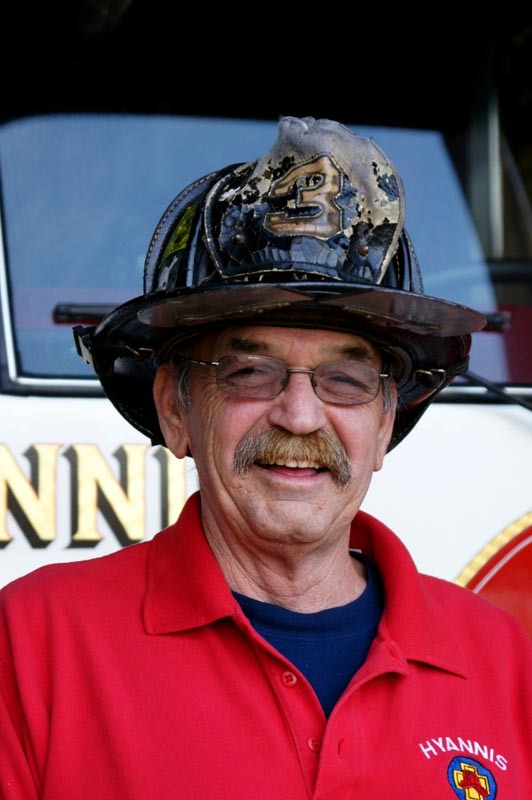 He became call firefighter in 1969 and a fulltime firefighter in 1972. 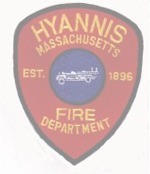 He is a founding member of the Hyannis FF IAFF Local 2172. 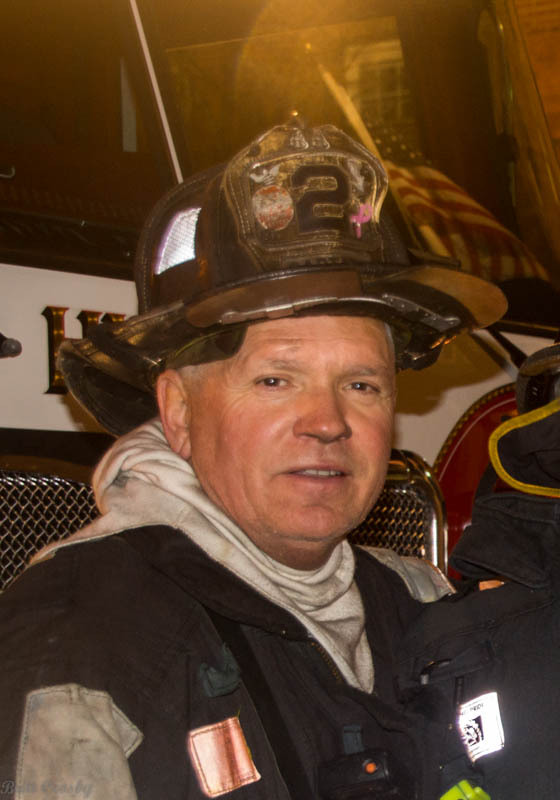 He has served many years as a Captain. 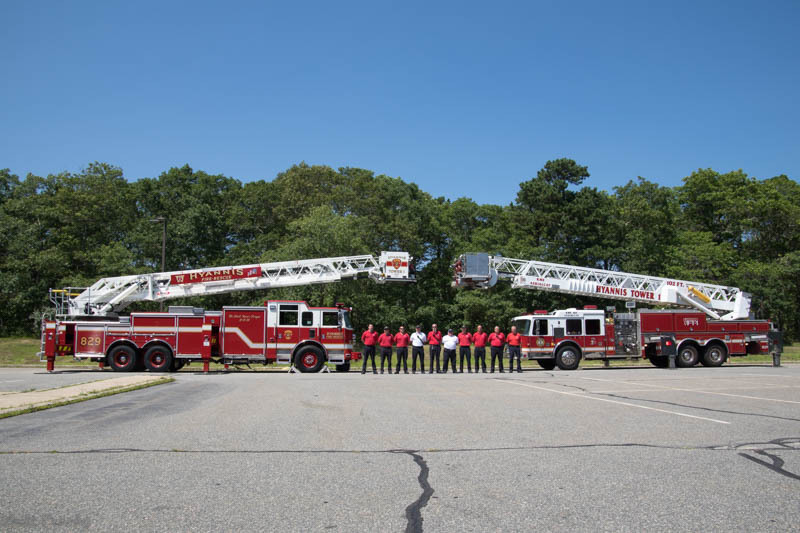 "Captain Craig" is one of a family of firefighters including his father Richard who served as a Hyannis Fire Chief, his brother Rick who retired as a Dennis Captain, brother Eric who is also a Hyannis Captain, and brother Kent who is Deputy Chief in Harwich. 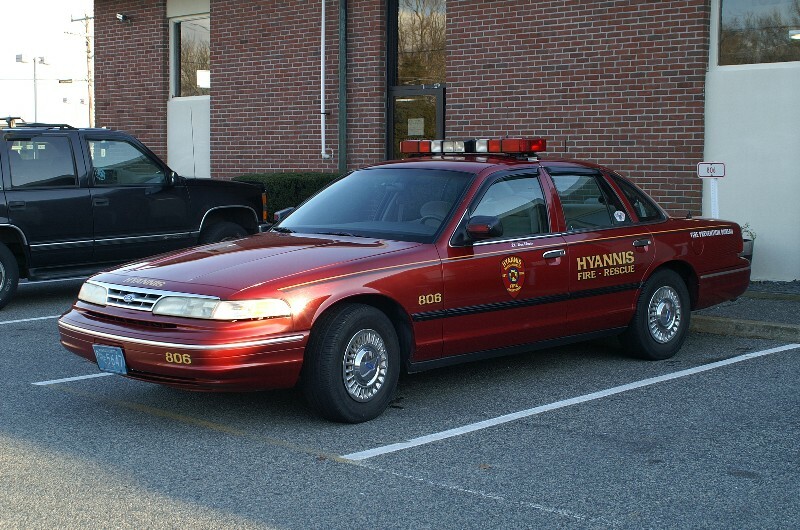 Mark Storie will be promoted from Lieutenant to Captain replacing Captain Farrenkopf. 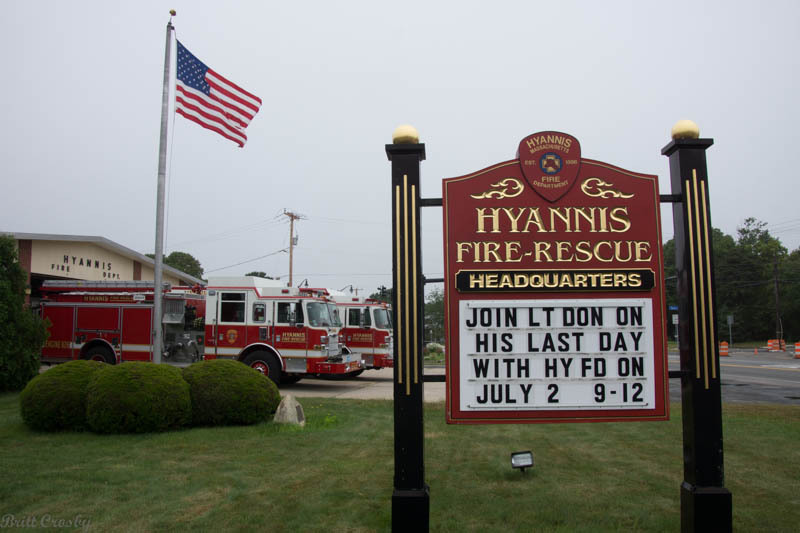 retired after 34 years of service to the Hyannis Fire District on July 2, 2013.
many who wished "Lt Don" well on his last day of work! 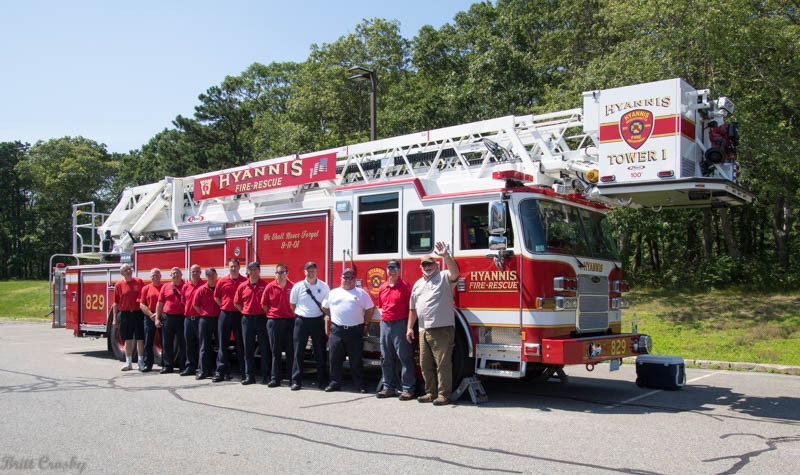 after 36 years with the Hyannis FD. 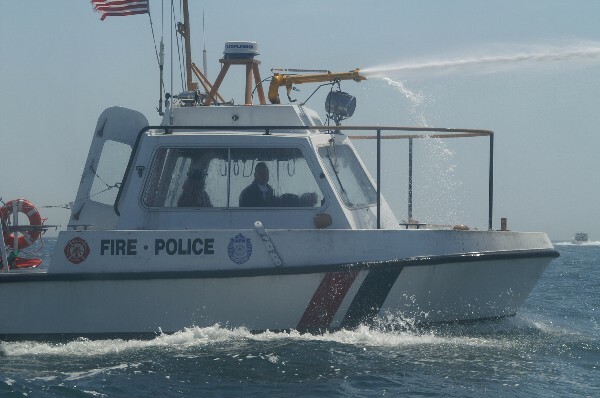 and Harwich Captain (Deputy) Kent Farrenkopf. 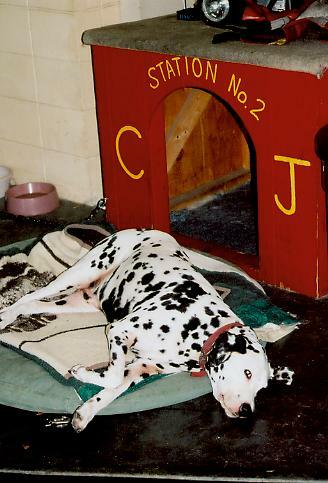 Mascot and Dalmatian "C.J." 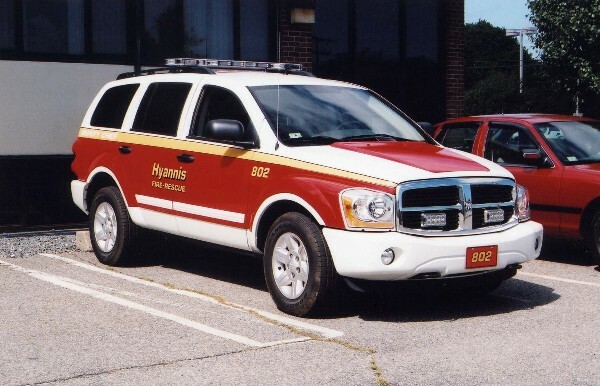 on Saturday June 25, 2005.
make the difficult decision recently to euthanize the station mascot. 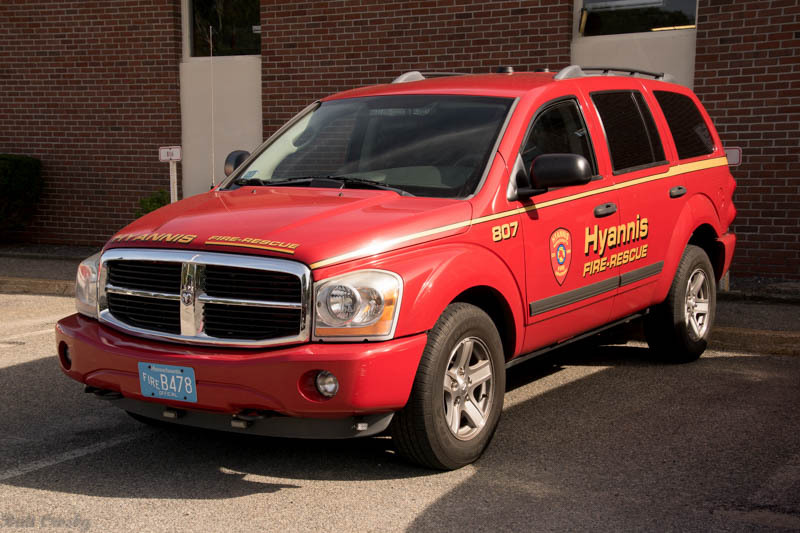 forward to seeing "The Fire Dog" on visits to the fire station. 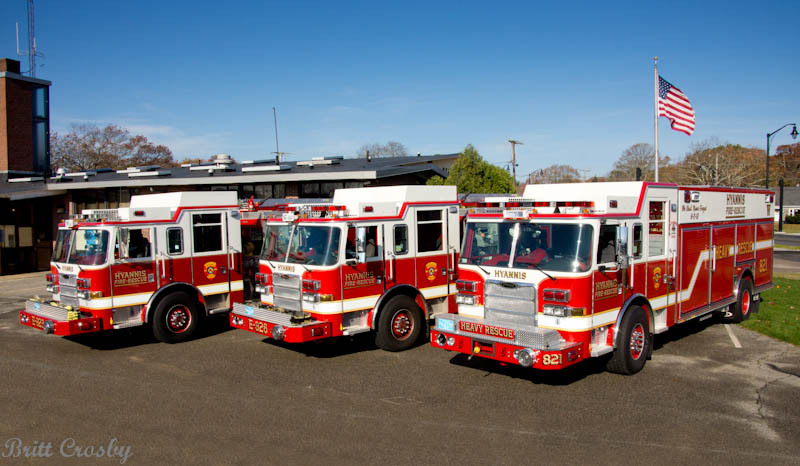 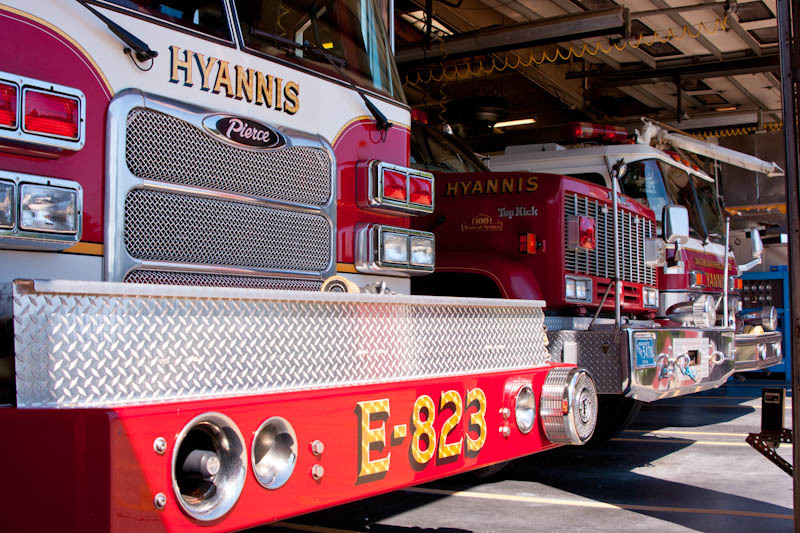 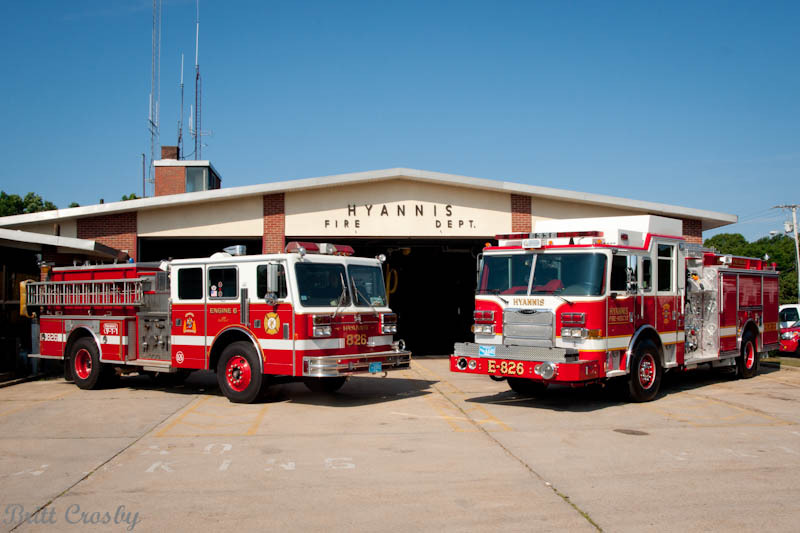 Hyannis FD had a number of concerns with the Cape's 800 mhz trunked radio system. 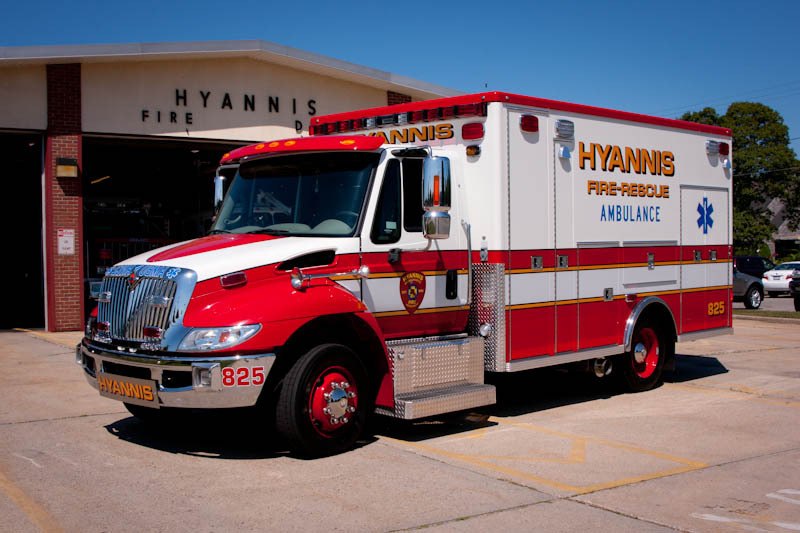 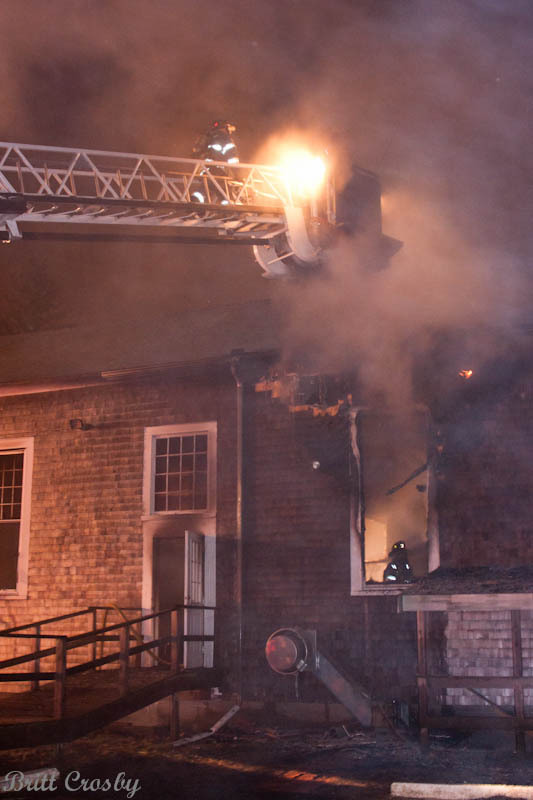 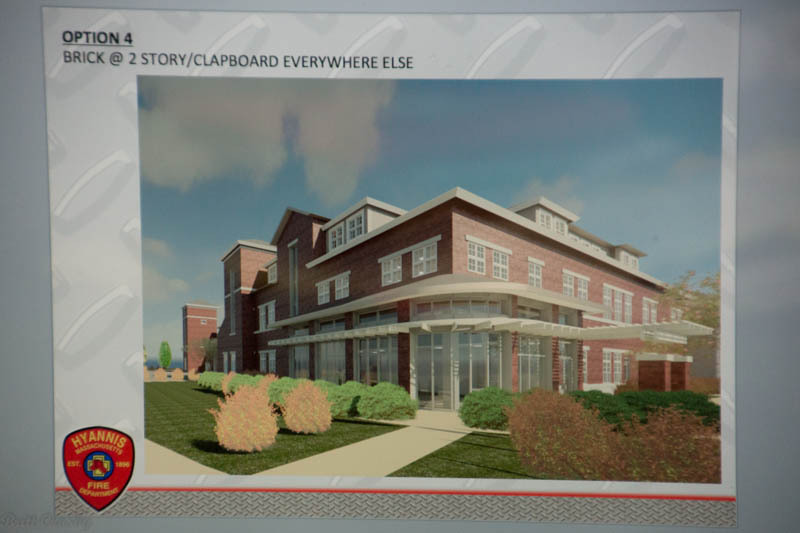 In building coverage was not satisfactory in a number of major buildings within Hyannis including Cape Cod Hospital, the Cape Cod Mall, Barnstable High School, and others. 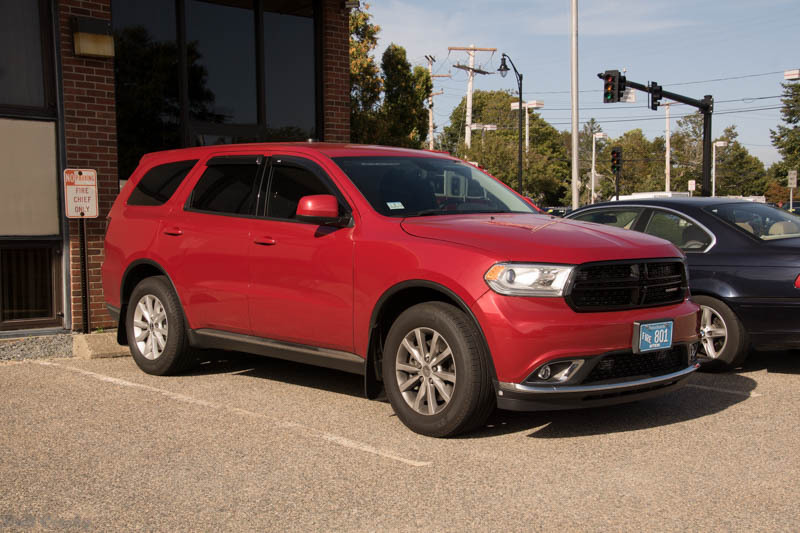 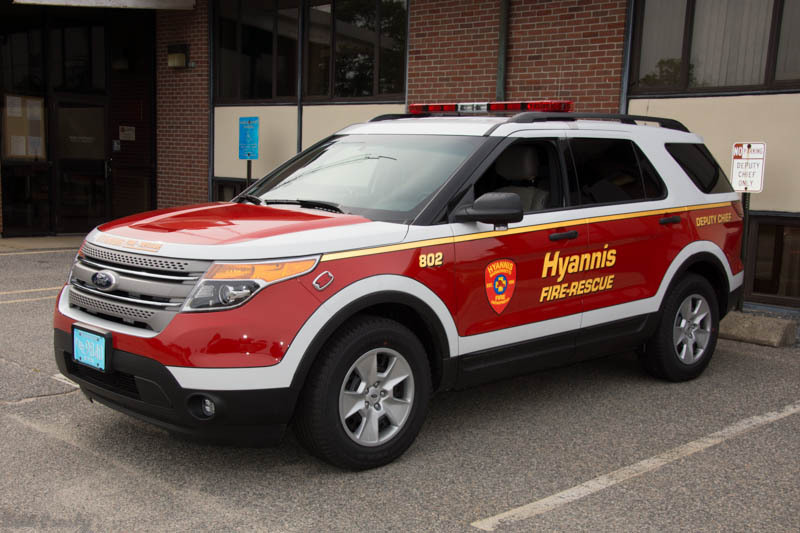 As a result Hyannis experimented with a number of options ranging from low band repeaters to 400 mhz to 800 mhz options. 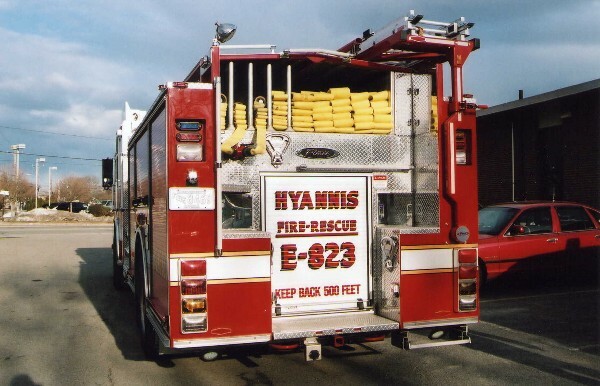 Hyannis has now (June 2002) begun simulcasting its communications on both 33.94 and a NEW 868.2125 conventional channel. 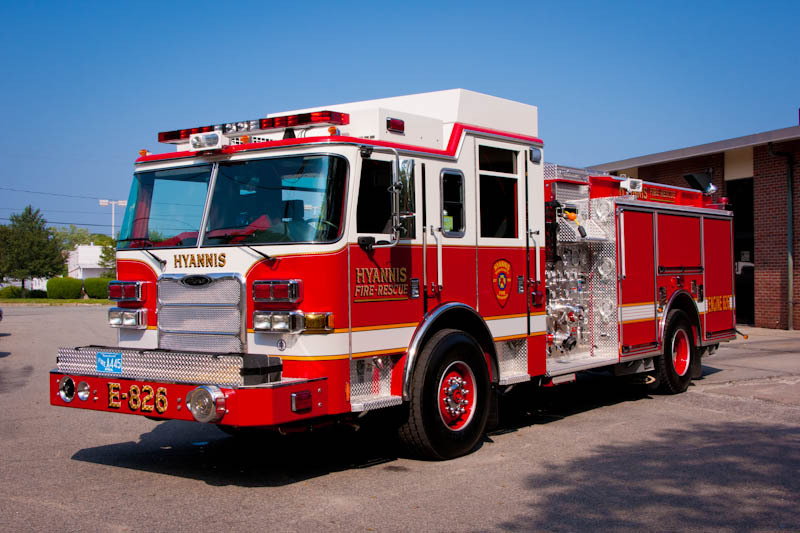 Hyannis retains its 800 mhz trunked talkgroup as well as its 460.625 channel. 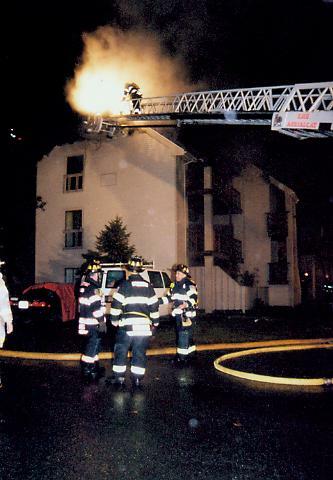 More to follow.... June 2002. 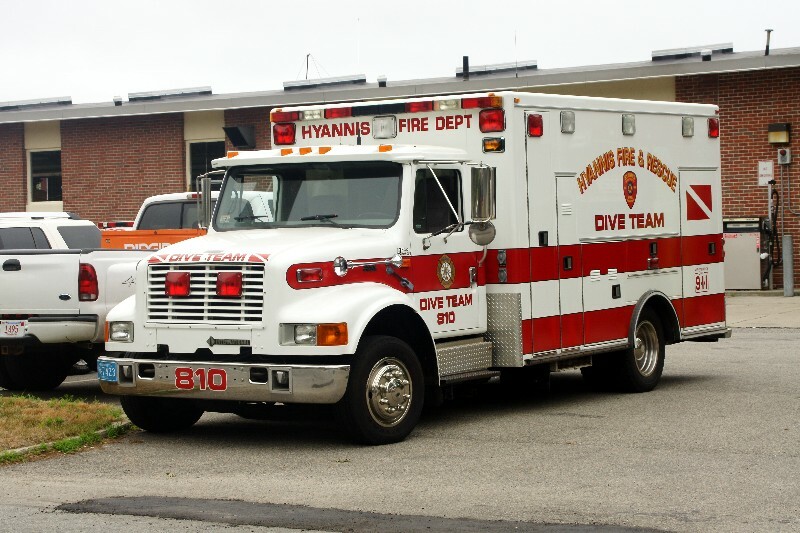 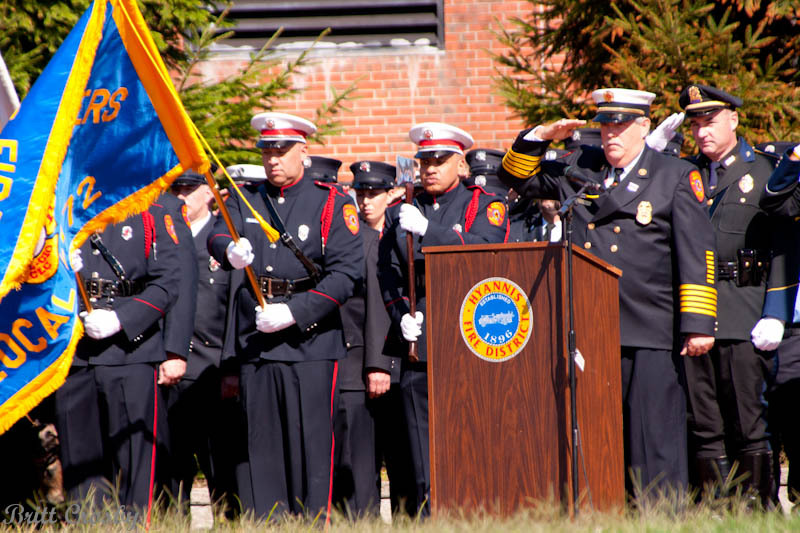 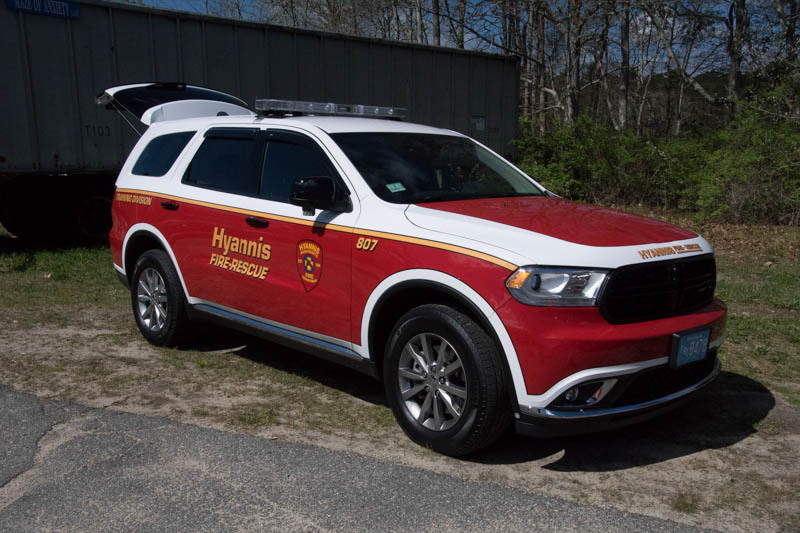 Hyannis Fire Department - Busiest on Cape! 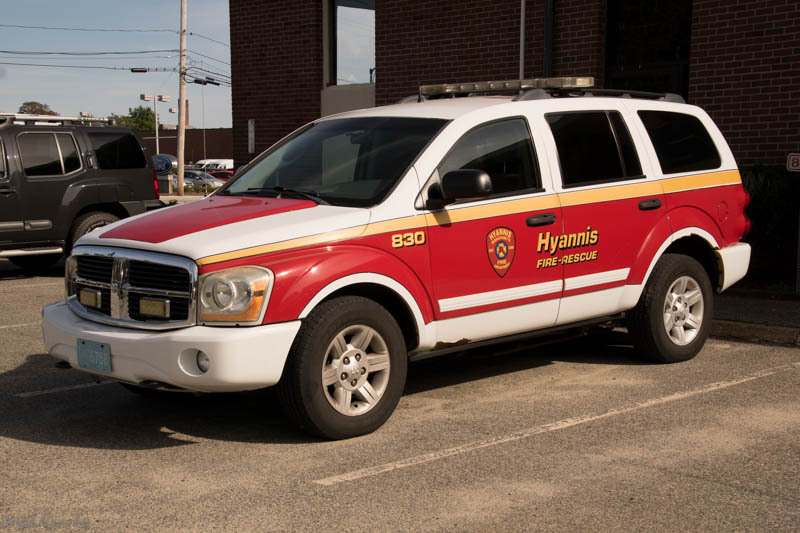 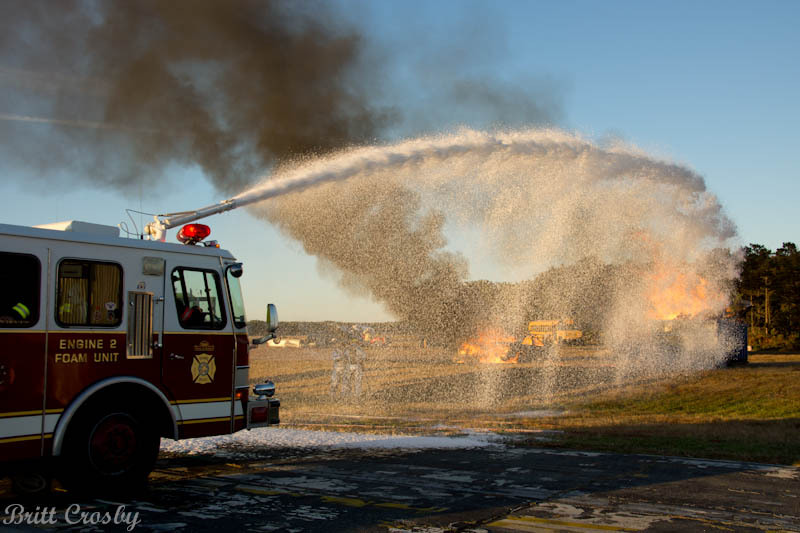 Once again, HYFD is the Cape's busiest Fire Department. 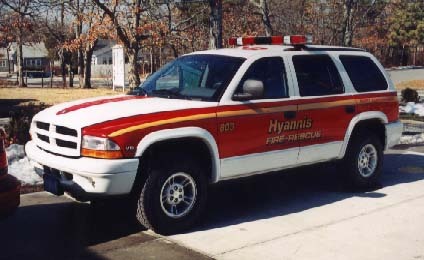 Hyannis responded to 5,657 runs in 2001, an increase of 370 runs over the 5,287 runs in 2000. 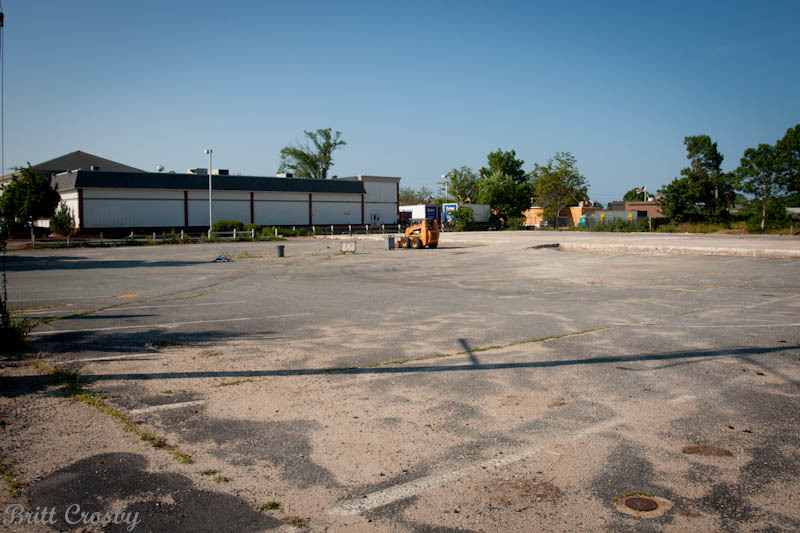 This is a 7% increase in runs making it an average of 15.5 runs a day. 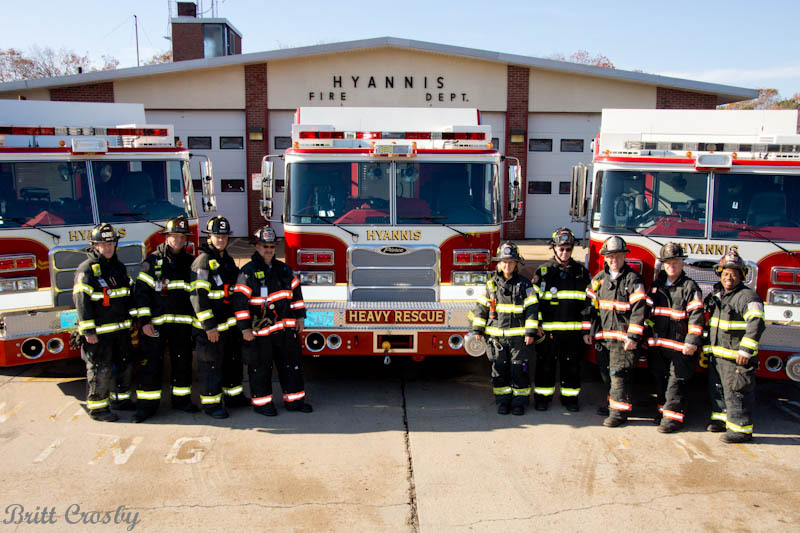 Hyannis runs with 11 personnel per shift, one of them serving as a dispatcher. 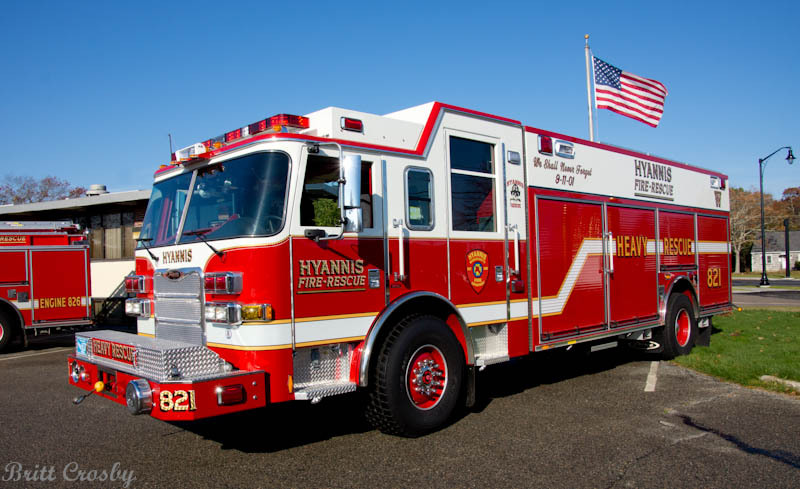 Hyannis Tower 829 displays the colors in the weeks following Sept 11, 2001. 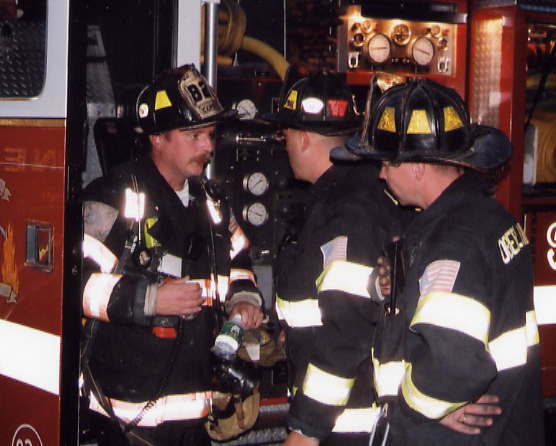 Several HYFD personnel responded as part of MA-TF1 FEMA team to the WTC spending 8 days at ground zero. 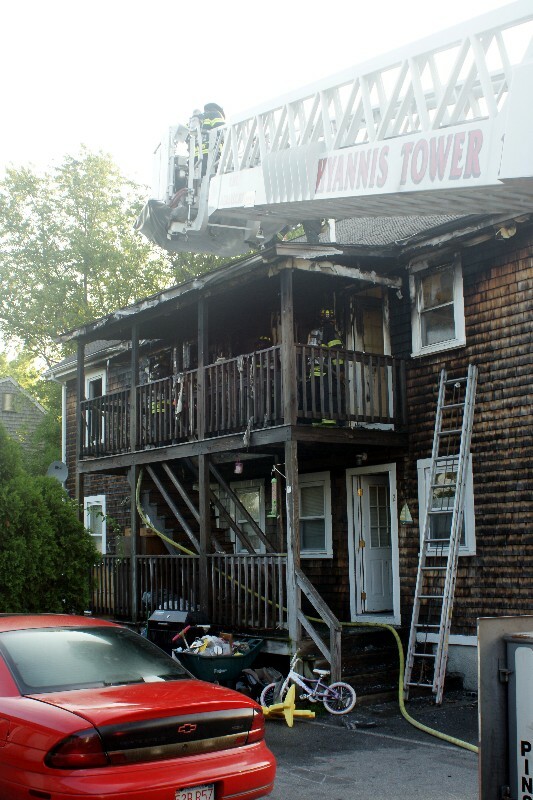 One woman later died from injuries sustained in the fire. 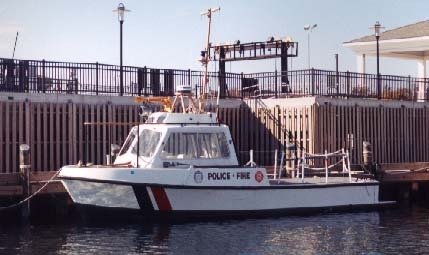 at 0800 hrs on March 19, 2011 after 36 years of service. 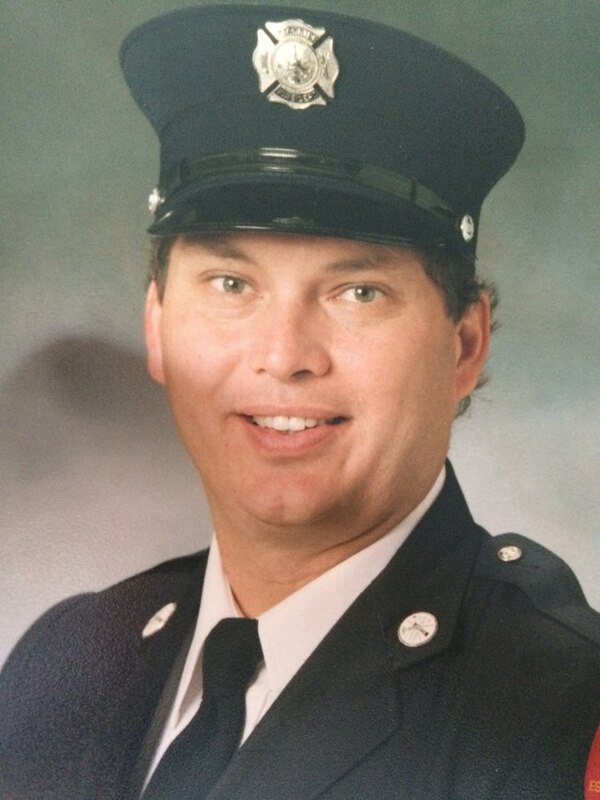 Danny was son of former Fire Chief Glenn Clough. 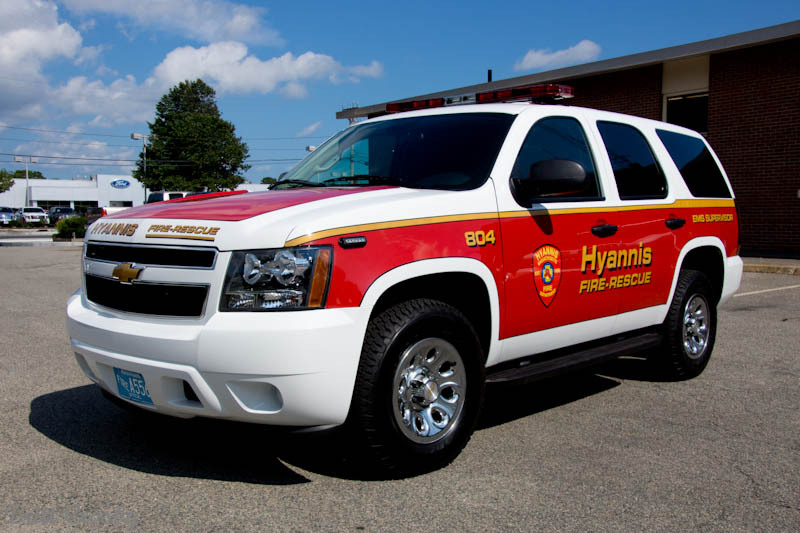 His son Ryan is a Hyannis Firefighter/Paramedic. 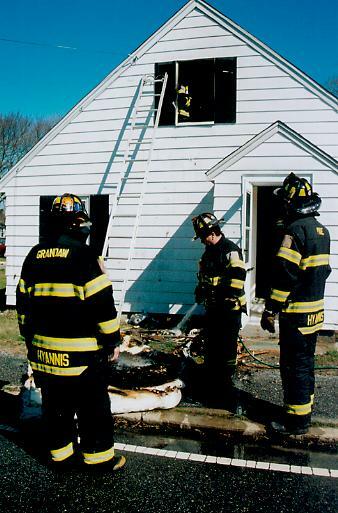 Hyannis Fire Department responded to a house fire at approximately 0900 hours on April 2, 2002. 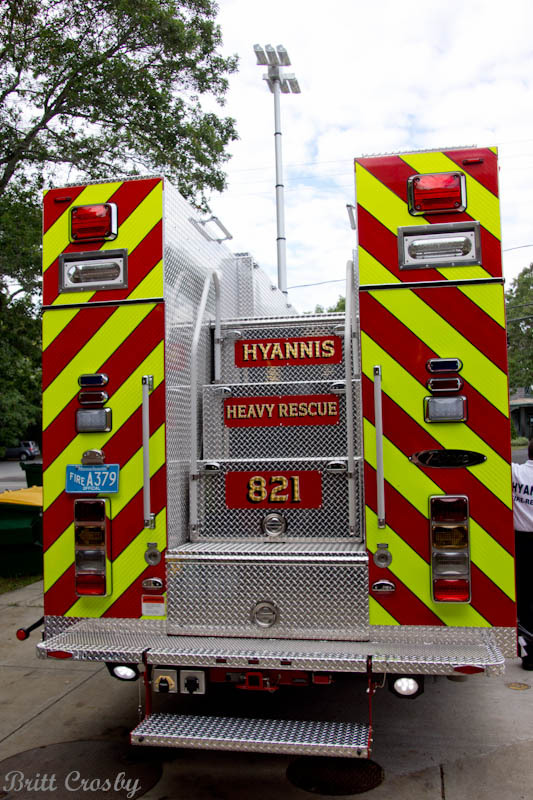 Police reportedly were first to arrive at the house located on Winter Street at the corner of Chestnut Street. 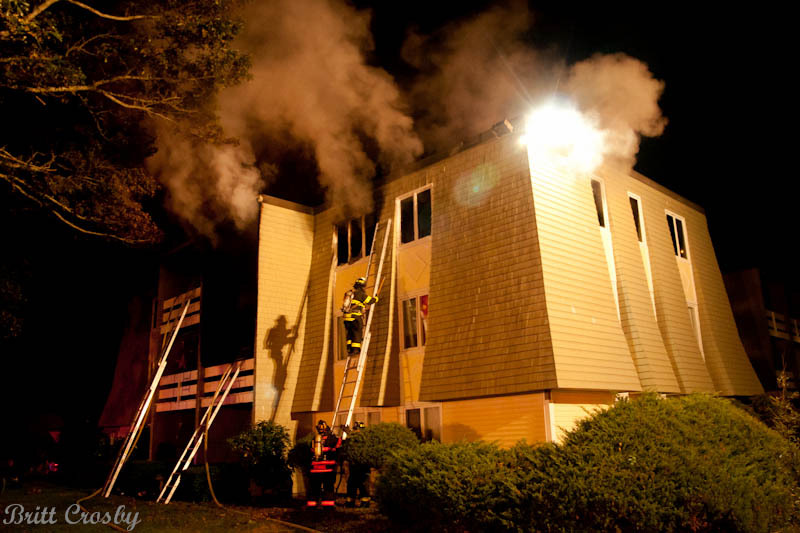 Heavy smoke was coming from a 2nd floor bedroom. 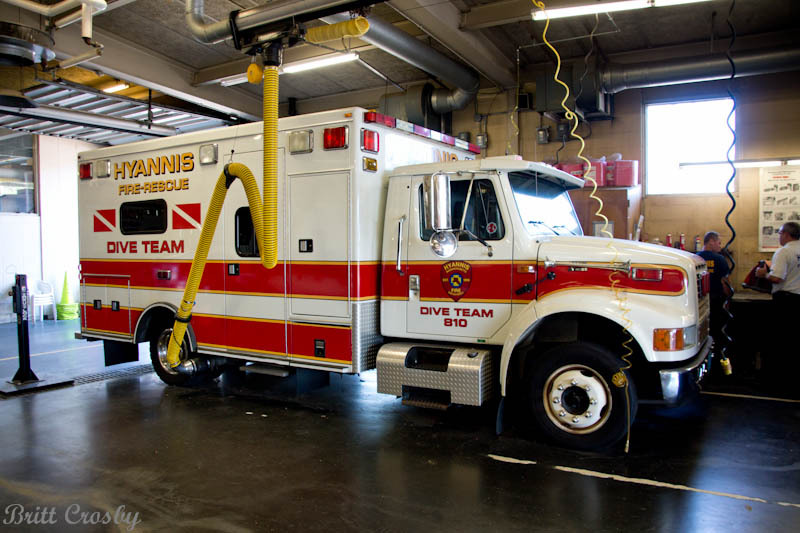 Firefighters rescued a male who was severely burned and unconscious. 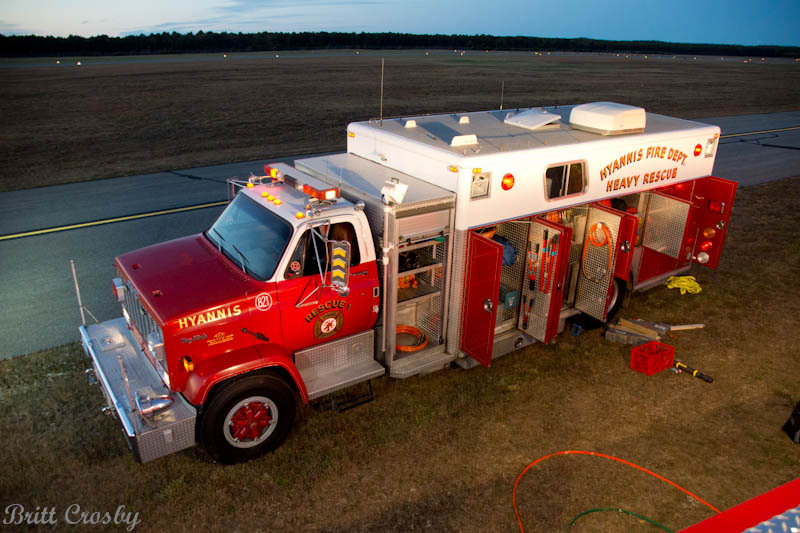 The fire was quickly controlled and the victim was transported to CCH due to a delay in medflight availability. 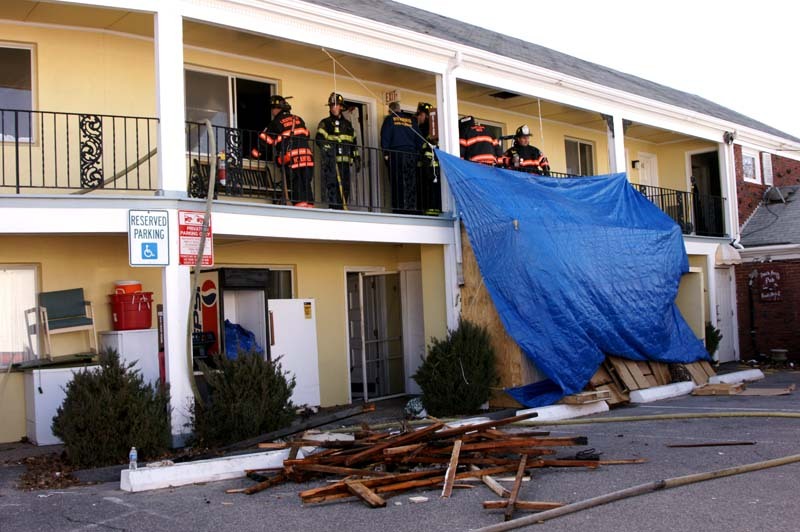 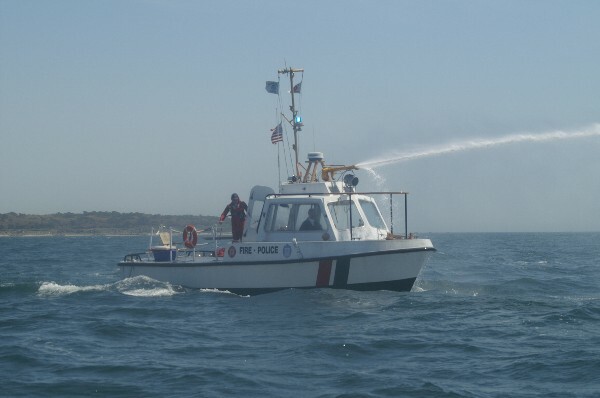 A police officer was also treated for smoke inhalation resulting from initial rescue attempts. 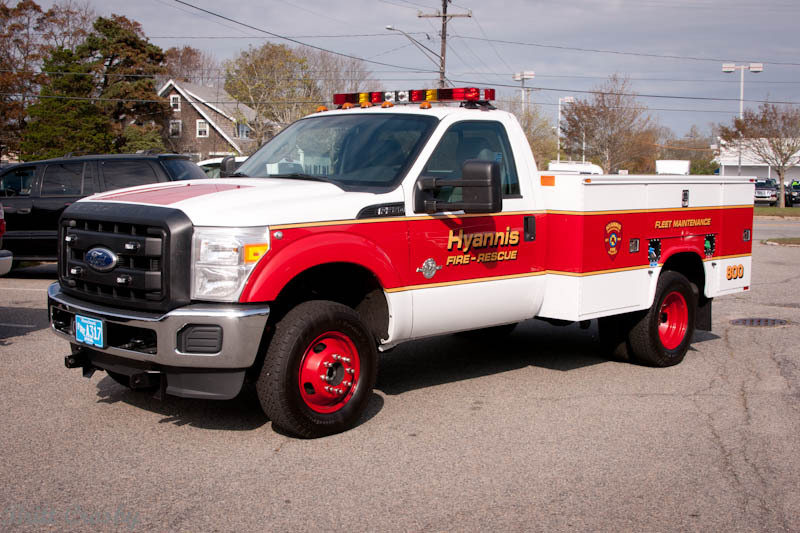 COMMFD & Yarmouth FD assisted HYFD.